Pre-K children at Forest Hills' P.S. 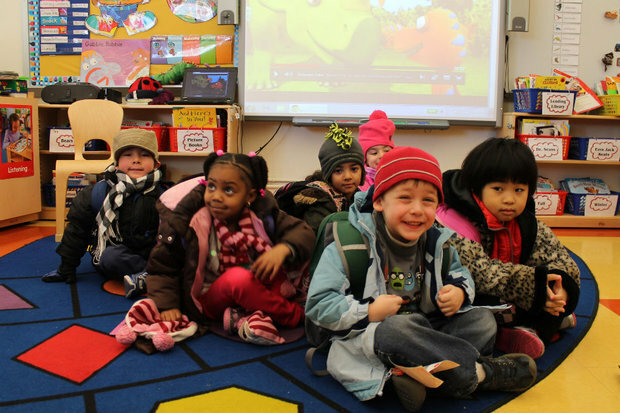 303, which is among the city's most popular when it comes to kindergarten applications, DNAinfo found. QUEENS —Small classes, a focus on educating the “whole” child and strong arts programming are some of what the city’s most popular elementary schools have in common. Several embrace diverse student bodies, and parents and educators at many of these schools often use the word “joy” when talking about education. Kindergarten applications — which are due Friday for families with children born in 2012 — allow parents to select up to 12 choices, with priority given to those who live in a neighborhood school’s zone and have a sibling already in that school. But that doesn’t stop many parents from trying to get into schools outside their zone, whether they're in a nearby neighborhood or a lottery-based facility that’s open to 5-year-olds in their community school district and perhaps beyond. DNAinfo New York analyzed the Department of Education’s 2015 kindergarten application data, obtained through a Freedom of Information Law request, and looked at the schools that received the most applicants ranking them first or second compared to the number of seats available. The most popular, unsurprisingly, were the lottery-based schools since they have a wider pool of applicants than neighborhood schools. The top lottery-based school in the city was Forest Hills' P.S. 303, the Academy for Excellence Through the Arts — a small early education school that opened in 2008 that only goes up to the third grade. Demand was so high that there were nearly 10 families ranking it as their top or second choice per seat. “I wanted to make sure that the arts were as important as the academics,” said founding principal Barbara Leto. She also said that differentiating lessons and homework is critical since children come in performing at different levels. With such a small school — there are only two classes per grade and, while kindergarten tends to have about 25 kids per class, the other grades have between 19 and 24 kids — Leto spends a lot of time in classrooms and not only knows all of her students’ names, but knows when they get new glasses or if they’ve been sick — and she talks to the kids about these things. The school is expected to expand in 2019 with the addition of two classes per grade, plus fourth and fifth grades. The map below shows the target number of seats at each school and the total number of applications received, regardless where a family ranked it. Other popular lottery-based schools, based on DNAinfo’s analysis, included East Harlem’s Central Park East 1, a small, inquiry-based, child-centered school that is one of the most diverse schools in the city and has long been considered a model of a progressive public elementary school. The ratio of applicants to seats there was 8 to 1. After last year’s application period, however, it became mired in controversy with parents saying the new principal doesn’t support the school’s progressive legacy. Staten Island’s Michael J. Petrides came next, with more than seven applicants ranking it first or second for every seat. The school, according to its website, recognizes the individuality of each child and uses alternative strategies of a lab environment, along with integrating the arts. Two of the popular lottery schools were affiliated with colleges: Harlem’s Teachers College Community School, which not only celebrates having a diverse student body but also a diverse staff, and the Queens College School for Math, Science & Technology, which accepts students from across Queens. Two of Brooklyn’s most progressive schools, known for their active parent bodies, large numbers of kids opting out of state tests and a strong commitment to diversity — they were among the first to have diversity-based admissions — were on the list: Fort Greene’s Academy of Arts & Letters and Carroll Garden’s Brooklyn New School. Also on the list were were P.S. 150, known as the TriBeCa Learning Center, which has just one class per grade; and the Upper East Side’s Ella Baker School, started by educators from Central Park East that also focuses on hands-on exploration and lots of class trips. DNAinfo also looked at the city’s neighborhood schools that attracted interest. Some of those that garnered a lot of first and second rankings but had few seats were new schools opened to relieve overcrowding from nearby ones, like Corona’s P.S. 330. That school opened in 2013 but was forced to waitlist dozens of families last year after it cut kindergarten classes from six to two. Other popular neighborhood schools were Kingsbridge’s P.S. 7, Cambria Heights’ P.S. 176, Manhattan Beach’s P.S. 195, the Upper West Side’s P.S. 9 and the Upper East Side’s P.S. 6, where Schools Chancellor Carmen Fariña was principal several decades ago. Also on the list were Williamsburg’s four-year-old P.S.414, known as the Brooklyn Arbor School, and Astoria’s P.S. 85, or Judge Charles J. Vallone School, opened in 2009. Park Slope’s P.S. 118, the Maurice Sendak Community School, a new small school that currently goes up to third grade and will reach fifth grade in two years, was also among the most popular, which didn’t surprise Carrie McLaren, a mom whose child is in third grade there. “Joy” is the operative word of the school, which recently changed its homework policy, ditching traditional worksheets in favor of play-based alternatives that can be done in collaboration with family members. The school has two teachers in every classroom and limits class size to about 25, McLaren said.